It’s been said that the longest journey we will ever take is the eighteen inches from our head to our heart. Ah, the heart, that sentimental messenger often relegated to the weepy, happy ending found in bad movies. Can the heart ever be trusted? In this day and age the heart has a new role, that of a fierce warrior, owing to its Middle English origin, coer – heart, courage. In other words, the transformer responsible for changing the world from the love of power to the power of love is the oft-maligned heart. A stand for heart is a courageous stand for love, and it’s showing up in all walks of life traveling around the globe. 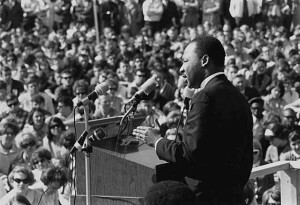 Dr. King giving a speech at an anti-Vietnam War rally at the University of Minnesota, April 27, 1967. After the Voting Rights Act of 1965 was passed, Dr. King began to publicly speak out against the war. When I look at today’s headlines I often ask myself how we can truly stand for love, for heart in the face of all the events that disturb our world. We have the power, here and now, to do just that and influence the future of humanity. I believe that there comes a time in everyone’s life when you are called to stand. I’m not talking about a reactionary or posturing stand – it’s a stand for, and not against, life. It is a stand because you’ve lived to see another day. It is a stand because you know of a better way. It is a stand for life when death seems near, and a stand for light when darkness is about to descend. It is a place to stand because you have been so fortunate or so inspired that you must give something back. It is a soul stand. The great leaders who have taken a soul stand have left an inspiring legacy. I feel passionately that this legacy must be shared and kept alive as spiritual inspiration for future generations. I think of the Dalai Llama and the Tibetan monks and nuns who took a stand for freedom and crossed treacherous mountains, internal and external, for their faith. Gandhi too, was a man to stand. They threatened his home, family, body, and pride. He had transcended it all — his stand for love reigned supreme. And the inspiring words of “I have been to the mountaintop … I may not get there with you today, but that’s all right” and “Today, you shall be with me in Paradise” ring clearly in my ears. To stand is the difference between non-violence and nonviolence. The former is simply describing the absence of violence; the latter is taking a stand for the presence of love. I am perhaps most inspired when I think about the twelve disciples who had to summon up enormous courage to take a soul stand in the pre-Christian Roman Empire. They were the students of an itinerant Jewish Rabbi who had his own earth-shaking stand to take. In 1998 I wrote the following poem when I was in need of guidance in the guise of courage for my next moment of transformation. Could I remember that I would stand for love regardless of whatever appeared before me? Its message feels quite relevant at this juncture in our evolution to remind us what we, individually and as a global village, stand for. Perhaps you, too, need a place to stand as you strive for a life of peace. Regardless of what appears before me today, I will stand for love. Today, I will love deeply. Today, I will love without the expectation of a response. Today, I will love without hesitation or reservation. Today, I will love for the sheer joy that it brings. Today, I will love with honor and courage and dignity. Today, I will love because it is all that I am and all that I can do. Today, I will not make love complicated or painful or dramatic. Today, I will love without judgment. Today, I will love honestly and compassionately. Today, I will be patient when anything that doesn’t look or feel like love comes up for healing. Today, I will remember that I am never in love alone. Today, I will love because it is my divine birthright and my divine destiny. Today, I will stand strong on the solid foundation that love has built in my life. I leave you with these lyrics from a song sung by Sly Stone in the ‘60’s: “Stand, in the end you’ll still be you. One who’s done all the things you set out to do.” Peace. Through her ministry, “Doorway Into The Infinite”, Maria holds the vision for the transformation of the consciousness of planet earth. She is a spiritual change agent committed to… educating people in the process of healing… empowering the world one creative thought at a time … and experiencing peace in our lifetime. Her articles, essays, and meditations have been published in various magazines. She has self-published numerous books and manuals, and released two recordings of guided meditations. She’s created a variety of classes, workshops, and spiritual performance pieces, where she expresses her profound interest in spirituality and peace. For more information, she can be reached at her website: www.be-the-change.com or at her e-mail: RevMariaS@aol.com.